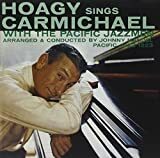 According to Richard Sudhalter in his Carmichael biography, Stardust Melody: The Life and Music of Hoagy Carmichael, Trumbauer asked Carmichael, “Why don’t you write a song about Georgia? Nobody ever lost money writing songs about the South.” Carmichael followed the advice, with Stuart Gorrell thinking of the title and helping out with the lyrics. Hoagy (vocal); Bix Beiderbecke (cornet), Ray Lodwig (trumpet); Jack Teagarden; Boyce Cullen (trombone); Jimmy Dorsey (clarinet/alto sax); ‘Bud’ Freeman (tenor sax); ‘Pee Wee’ Russell (alto sax); Irving Brodsky (piano); Joe Venuti (violin); Eddie Lang (guitar), Min Leibrook (bass sax), Chauncey Morehouse (drums). This recording did not turn out to be a hit, but success was just around the corner. In 1931, a pivotal and bittersweet year for Carmichael, “Star Dust” would appear on the pop charts five times, and “Georgia on My Mind” would become a number ten hit. But the good news was mixed with the bad; his college friend Bill Moenkhaus and fellow musician Bix Beiderbecke would both die at the age of twenty-eight. Ray Charles’ number one rendition in 1960 won the R&B crooner two Grammys for Best Performance by a Pop Single Artist and Best Vocal Performance Single Record or Track, Male. Willie Nelson’s 1979 recording won the Grammy for Best Country Vocal Performance, Male. This section suggests definitive or otherwise significant recordings that will help jazz students get acquainted with “Georgia on My Mind.” These recordings have been selected from the Jazz History and CD Recommendations sections. The Ray Charles version of “Georgia On My Mind” (The Genius Hits the Road) is not only the definitive recording of the tune, but is one of the landmark moments in the history of American popular music. Charles sings the tune as if it had been written with him in mind, and his performance casts a large enough shadow that it is now challenging to perform this song without showing some of his influence (not that this is a bad thing). Movement Primarily skips (3rds) in both directions; occasional leap (6th) downward. “B” makes use of a minor pentatonic scale, ascending in the first, third and fifth measures. The opening harmonic progression is similar to that of “Charleston” and “You’re Nobody ‘Til Somebody Loves You,” except that the III7 resolves to a minor vi instead of the VI7. From there, Carmichael takes off into his own direction. The chord progression implies a descending bass line, which could work very well. In the original key, this becomes: F –A7/E – Dm – Bbm/Db – F/C – E7/B – Bb, after which the progression goes up to C (the V7), returning to F for the first turnaround. The contrasting “B” section in the relative D minor is fairly stable harmonically, never straying too far from the tonic. The only unusual part of this bridge is in the fourth measure, where a flatted seventh in the melody and a B natural over a G major chord give a temporary impression of Dorian mode. The upward movement from I to II7 in the sixth measure is surprising but not jarring, creating just enough harmonic and melodic tension (at this point, the melody has just ascended a ninth) so the ear is prepared for the circle of fifths that return the piece to the original major key. Paris before World War II was a haven for expatriate American musicians. Freddy Johnson, a singer/entertainer, added an Armstrongesque touch to the Quintette of the Hot Club of France’s 1937 recording of “Georgia...,” along with guitarist Django Reinhardt and violinist Stephane Grappelli. A year earlier, another ex-pat, trumpeter and vocalist Bill Coleman (who recorded with Reinhardt), performed the tune with a trio, featuring yet again another ex-pat, the excellent pianist Herman Chittison. In 1931 Coleman Hawkins, soon to be an expatriate to France, England and Holland, recorded a version with a racially mixed band, the Mound City Blue Blowers. Hawkins’ standout solo makes the recording, which also includes a vocal by leader Red McKenzie and his kazoo-like solo on comb-and-tissue paper. The direct jazz relevance of this Ray Charles performance is open to debate. However, there is very little debate that this deeply soulful version of “Georgia on My Mind” is the definitive rendition of the song. Saxophonist Newman is closely associated with the music of Ray Charles and played on Charles’ original version of “Georgia.” Here, he takes a soulful and subtle turn on the song, paying tribute to his recently-deceased friend and former employer. Also featured prominently on this track are vibraphonist Steve Nelson and pianist John Hicks. Brown offers a preview of the soulful trio recordings that would augment his fame in the latter part of his career. His brilliant and prominently featured trio-mates here are pianist Cedar Walton and drummer Elvin Jones. They begin and end slowly, with a deep blues vibe, cranking up the tempo for a lengthy solo section in between. The contrasting styles of Johnson and Winding are always fascinating to hear in tandem, and they both shine on this slow, soulful performance. An added bonus is pianist Bill Evans, who displays his underrated blues feeling. Horn, always a master of understatement, gives an arrestingly subtle performance of “Georgia” here. In addition to her usual brilliant vocals and piano, she interjects some tasteful organ. Vocalist Kilgore and pianist Frishberg are joined by guitarist Dan Faehnle for a gently swinging tribute to Georgia. The beauty of this CD, besides the playing of Morgan’s superb quartet, is that the altoist thoroughly investigates three standards--“Georgia on My Mind,” “Cherokee,” and “Summertime”--plus five contemporary compositions by Miles Davis, Monk, and Coltrane. Recorded live at the Jazz Standard. Frank Foster’s robust tenor saxophone is bewitching on this fast-paced bop reading of the song. Organist Jimmy Smith digs a groove with this bluesy and soulful take on the song. A dreamy choir in the back completes the hip ambience. Pianist Charlap expresses a real affinity for the material with this heartfelt and lyrical reading of the song. Peter Washington on bass and Kenny Washington on drums slow the rhythm right down to an introspective crawl.